Clouds continue to portend change, but what kind? For centuries, many a sailor has learned to heed the message of high, windswept clouds to batten down their hatches. As the proverb goes, “Mares’ tails and mackerel scales make lofty ships to carry low sails.” Together, wispy cirrus clouds resembling horse tails and patchy cirrocumulus signal that a rain storm is on its way. But scientists are interested in other messages these high altitude clouds can share. 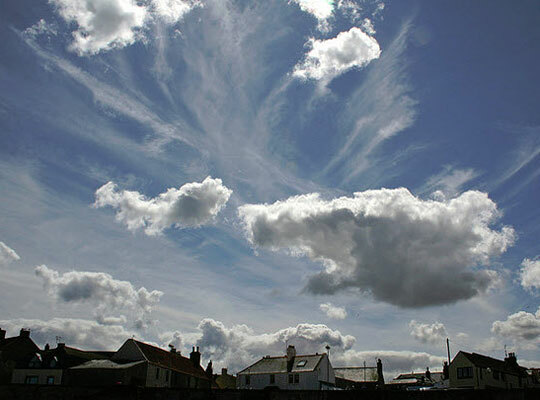 Thick, low clouds like cumulus reflect incoming sunlight while thin, high clouds like cirrus trap the sun’s thermal energy in Earth’s atmosphere. For researchers Tristan L’Ecuyer and Graeme Stephens who study how much heat the planet holds or sends back to space, known as Earth’s energy budget, this is an important distinction. Which type wins overall? That is an ongoing scientific debate, but L’Ecuyer and Stephens are chipping away at the answer. 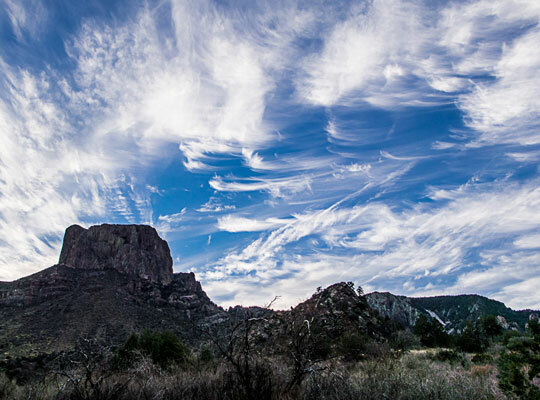 What scientists do not debate is that cirrus are no ordinary clouds. 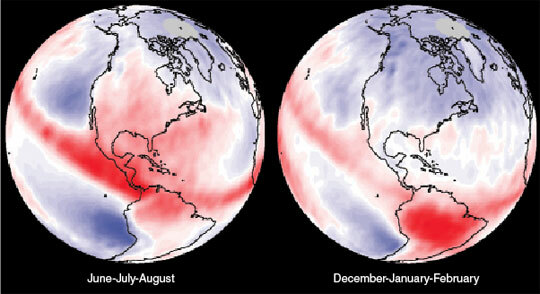 Understanding them may be key to understanding how Earth is going to handle continued warming. Most cirrus stream out of the chimneys of tropical cyclones or form at the top of boiling thunderstorms, and can stretch over entire continents when pulled by the jet stream. They are made of millions of tiny ice crystals of varying shapes, like disks and rods, and are sometimes so thin they are almost transparent. These features give cirrus an uncanny ability to allow solar radiation into the atmosphere, yet prevent it from reflecting back out into space. The power to trap heat means they can also squelch storms. Storms build when warm air rises over a pocket of cold air like a conveyer belt, causing the cycle of convection. When that warm air finds its higher spot in the atmosphere, it condenses into rain or ice droplets, depending on the altitude. But cirrus clouds hamper this cycling of air, and much of the precipitation that should follow. More heat and less rain may be a welcome change for seafarers, but it means cirrus also create a powerful form of positive feedback to a warming climate. Answering those complex questions required digging into data from not just one satellite, but three. They began their search with the NASA/French Space Agency Cloud-Aerosol Lidar and Infrared Pathfinder Satellite Observation (CALIPSO) satellite. Onboard, the Cloud-Aerosol Lidar with Orthogonal Polarization (CALIOP) instrument was designed to size up a cloud by pointing its laser at it and measuring the light that bounces back, what scientists refer to as lidar backscatter. L’Ecuyer, an assistant professor of atmospheric physics at the University of Wisconsin-Madison, explained how this works. “Suppose you turn on your headlights when it’s foggy outside. You can tell how much fog there is essentially by seeing how much light gets reflected back at you.” In a similar way, the CALIOP instrument measures the thickness of clouds from space, and is particularly adept at sensing the finer particles of cirrus clouds. It can also penetrate through thin cirrus clouds to see what lies below. Flying nearby on the CloudSat satellite was the perfect complement. Its Cloud Profiling Radar instrument was designed to measure another type of backscatter: radio waves. With radio waves, the researchers could begin to make out larger particles like snow and ice within a cloud, especially those in thicker clouds like puffy cumulus. They then combined these data with readings of optical thickness, yet another assessment of how bright clouds are, from the Moderate Resolution Imaging Spectroradiometer (MODIS) satellite. When the effects of low clouds were factored in, though, their models revealed that clouds continue to have a cooling effect overall, at least in today’s climate. The next step is to learn how the heating or cooling effect of clouds might change in the future. Computer models will help predict this, but scientists caution they need continual testing and honing. Because clouds play a large role in determining the global climate, an enormous amount of data must go into analyzing them, and there is no shortage of factors to consider. That means that even with massive amounts of data from the most sophisticated instruments available, there are a great number of unknowns. CloudSat Data Processing Center. 2011. Level-2 Cloud Optical Depth (2B-TAU). Version 6. Fort Collins, Colorado USA. CloudSat Data Processing Center. 2011. Level-2 Radar-Lidar Cloud Geometrical Profile, Cloud Water Content (2B-GEOPROF, 2B-CWC). Version 4. Fort Collins, Colorado USA. Henderson, D. S., T. L’Ecuyer, G. Stephens, P. Partain, and M. Sekiguchi. 2013. A multi-sensor perspective on the radiative impacts of clouds and aerosols. Journal of Applied Meteorology and Climatology 52:853–71. doi:10.1175/JAMC-D-12-025.1. NASA Atmospheric Science Data Center (ASDC). 2011. All-Sky Level 3 Lidar Data. Version 3. Hampton, Virginia USA. Trepte, Q. Z., P. Minnis, C. R. Trepte, and S. Sun-Mack. 2010. Improved cloud detections in CERES Edition 3 algorithm and comparison with the CALIPSO Vertical Feature Mask. Proceedings of the 13th Conference on Atmospheric Radiation and Cloud Physics. Portland, Oregon USA: American Meteorological Society. Processed CloudSat backscatter data and MODIS radiance data were obtained from the CloudSat Data Processing Center.